1. 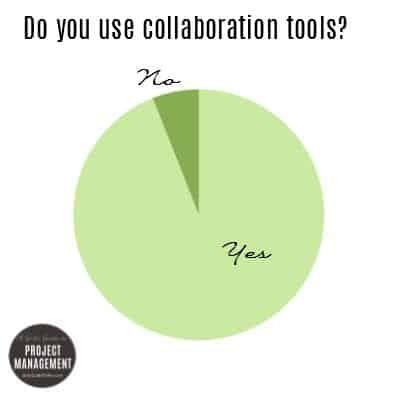 Do you use collaboration tools on your projects? I expected the vast majority of people to say they did. It’s far more common now than when I first started researching social media and project management about six years ago. 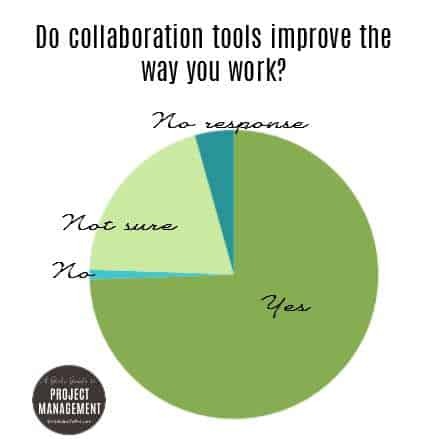 94% reported that they do use collaboration tools at work for project management. A tiny 6% said they don’t. 2. 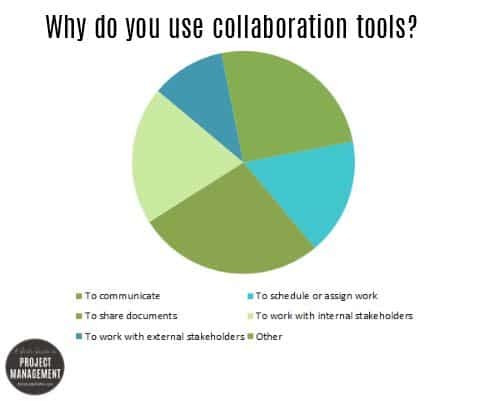 Why do you use collaboration tools? 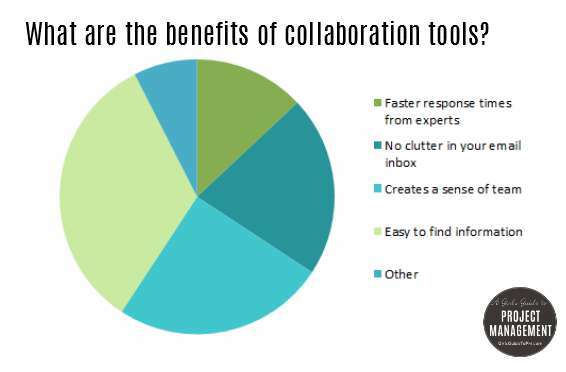 The most common reason for using collaboration tools is to share documents (27% said they used their tools for this). Communication was the second most common reason, with over one in five respondents saying they used it for that. The third most common response was working with internal stakeholders, claiming 20% of the pie. and document control/version control, which was mentioned a couple of times. 3. What benefits do you see from collaboration tools? The most common benefit from using collaboration tools is ease of finding information (33%). A quarter of respondents claimed that collaboration tools help them create a sense of team. In the survey I did in 2011 only 18% of people said that they thought improved team morale was one of the benefits they were seeing as part of using social and collaboration systems at work. I hope this shows that businesses are getting better at finding ways to improve how virtual teams work effectively. Other: 8% including responses like having one source of the truth, staying organised, displaying information visually and reaching a wide audience without email. The remaining 40% of respondents ticked ‘Other’ and told me about one or more tools that they used. I wasn’t expecting the market place to be quite so fragmented. I can pick out some trends. Microsoft is still the market leader. Roll Yammer and Sharepoint in with other Microsoft tools and 38% report using Microsoft-owned products (perhaps with some others in the mix too). Less than 5% reported using Google tools. This points to Google being far less feature-rich for a mature commercial organisation and also perhaps questions whether businesses are really buying into cloud services at the moment. About 5% said they were using all or part of the Atlassian suite: Jira and Confluence. I was expecting the responses here to be mainly ‘my team’ or ‘my department”. Again, it wasn’t what I expected, with 60% saying that the collaboration tools in use were deployed across the whole company. My 2011 survey had this at only 37% so it’s increased significantly. The ‘just in my department’ results have gone down since 2011. Previously at 20%, today only 12% of respondents said that the tools they use are department-specific. I think this is a good thing: we’re seeing enterprise adoption of collaboration technologies, which points to less silo working and better cross-team engagement. 6. Do collaboration tools improve the way you work? I asked this question in 2011 but it was slightly different. Then I framed it as ‘Can/Do social media tools improve the way you work?’ I wanted to make it theoretical so that people who were supportive of the concepts but not actively using them could also express their opinion. This time round I expected more people to be using them so the question was different. In 2011, 7% disagreed that this technology had the ability to improve the way they worked. This year, the results showed that only 1% feel they do not add any improvement. 20% weren’t sure (compared to 17% who had neutral feelings in 2011). 74% felt that collaboration tools do improve the way they worked. This actually isn’t that different from the 2011 results of 76%. I suppose I thought the perception of the usefulness of technology for managing projects would have gone up, but we have to acknowledge that everyone feels differently. The major difference this year is that I think the responses are based on practical experience, rather than a theoretical opinion about a toolset the respondents weren’t actually using. 7. Will you continue to use them in the future? Nearly 70% of people reported that they would continue to use collaboration tools at work and they thought their use would increase. 32% said they would continue to use them and their usage would be about the same as now. Interestingly, nobody said they would stop using them and their use at work would decrease, although one person wasn’t sure. A final person said they would use them more when more people adopted them, which is an interesting point. The more traction a tool has within a project team, department or company, the more useful it becomes. Thanks very much to everyone who took the time to fill in my survey! Survey ran between 17 August and 17 September 2015.
hi elizabeth, thanks for the great article! may i ask? who is the participants of this survey? Hi. They were self-selecting, I imagine blog readers or those who are subscribed to my newsletter. Thanks, Niraj. I’ve got your email as well and will get back to you soon. I have to say I’m quite surprised that only 10% of of respondents use Trello, and just 7% of them use Slack. I would have expected these figures to be at least twice as high. Actually, our product, Sher.ly features full integration with Slack, as we think really highly of it. The survey was people who had self-selected to fill it in and statistically just shy of 200 people isn’t that many. I did include them as options because I thought they were the trend-setting, productivity boosting tools of the moment. As we’ve seen many times with PM, the industry takes a while to catch up with the tech and it’s quite likely that people in other jobs and departments are using these tools while project managers are not.